This tour will take us in the territory of the most fascinating animal in the Pantanal: the jaguar. 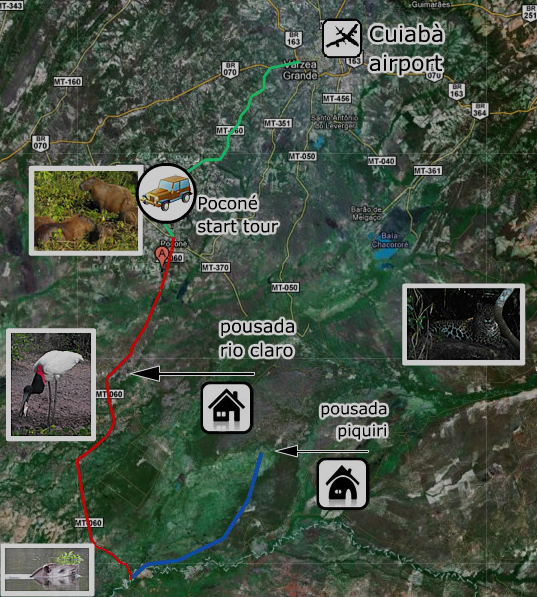 Stages: Cuiabà Airport; Poconé; Pousada Estancia Vitoria; Pousada Piquiri; Pousada Rio Claro. Departure for Poconé (the capital of the Pantanal); short visit of Poconé and departure for Pousada “Estancia Vitoria”. In the evening, after dinner in pousada, there is a short night safari, during which you could meet various animals and night birds, including crab-eating foxes, tapirs, raccoons, white-lipped peccaries and ocelots. Departure in the morning for “Pousada Piquiri”, located at the bank of the Piquiri River, a tributary of the Rio Cuiabà (two hours of sailing from Porto Jofre), where you will be able to catch sight of a jaguar; to reach the river we will arrive at the end of Transpantaneira (the famous dirt road crossing the North Pantanal for 150km), so we will take a boat that will take us through the waters of Rio Cuiabà for a few hours as far as the Pousada, where you will leave your baggage and we’ll have lunch. The rest of the day is given to search for the jaguar. Day entirely given to search for, study and contemplation of the jaguar. The entire Pantanal gives shelter 4000-7000 specimens of the third largest feline in the world and more than 200 specimens were classified in the region. Day entirely given to search for and study of the jaguar. Departure from Pousada Piquiri to come back to Pousada Rio Claro. Lunch in pousada and in the afternoon you could enjoy a nice canoeing tour along the river nearby, where you are allowed to fish in the most abounding in fish waterways in the world and where you are able to see the fearsome piranha. In the morning you could go for a walk inside the pousada. Transfer to pousada “Estancia Vitoria”, lunch in pousada and in the afternoon there is a ride (or an ecological walk, by choice) nearby. In the morning there is a canoeing tour or a ride (at the guest’s choice), followed by lunch in pousada. Back to Cuiabà airport and possible visit of artisan stores for the purchase of typical products and souvenirs, in relation to flight schedule.